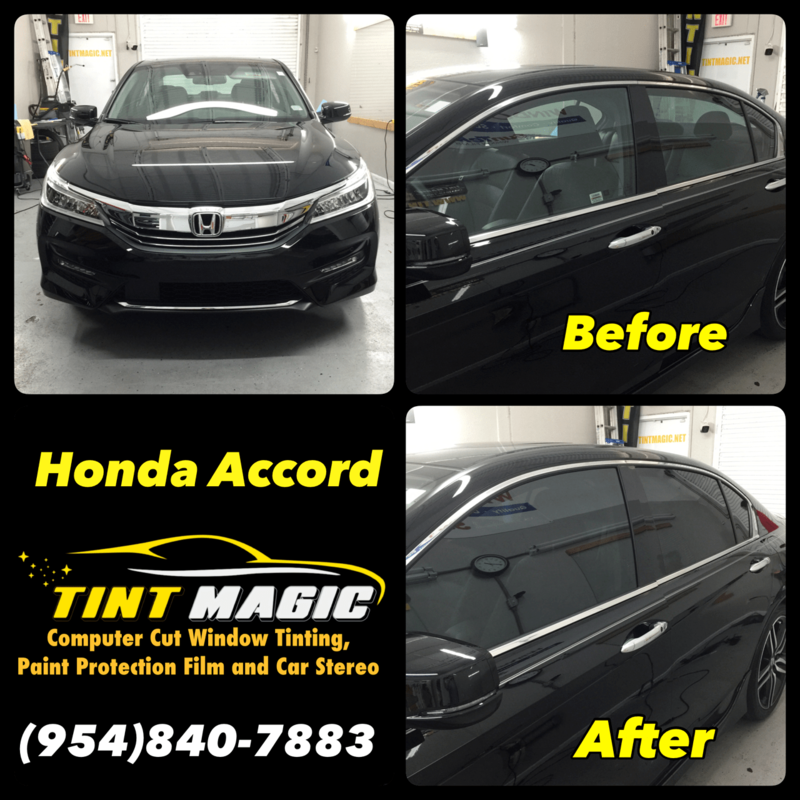 Honda Accord at Tint Magic Window Tinting serving Coral Springs, Parkland, Tamarac, Coconut Creek, Sunrise, Margate, Weston. Call us for the best quality and service! (954)840-7883. The Honda Accord delivers driving fun in a practical package; all models (except the hybrid) are 2017 10Best winners. A 185-hp 2.4-liter four and a six-speed manual are standard in the coupe and sedan, while Sport models make 189 hp. A CVT is optional, as is a 278-hp 3.5-liter V-6 with a six-speed automatic; the coupe offers a six-speed manual. The hybrid saw 45 mpg in our test. EX models and above have Apple CarPlay and Android Auto, but some may find the button-less infotainment system annoying. Among all these alternatives, it’s a veritable proving ground of clever engineering approaches, and the Accord hybrid is the outlier in its class. It’s laid out almost as an electric car, with the four-cylinder engine turning an onboard generator—most of the time, that is. The front-wheel-drive Accord hybrid eschews the transmission as we know it, instead using a clutch and two electric motor/generators. One motor is geared directly to an Atkinson-cycle, 2.0-liter four-cylinder engine—making 143 horsepower and 129 lb-ft of torque—with a clutch connecting them to the differential; the other motor is geared directly to the differential. This enables three distinct driving modes: an EV mode using only battery power, a Hybrid mode that uses electricity to propel the car with the gasoline engine powering the generator, and a more elusive Engine Drive mode employed between approximately 44 mph and 75 mph under certain conditions, during which it will clutch the gasoline engine in at a fixed ratio.